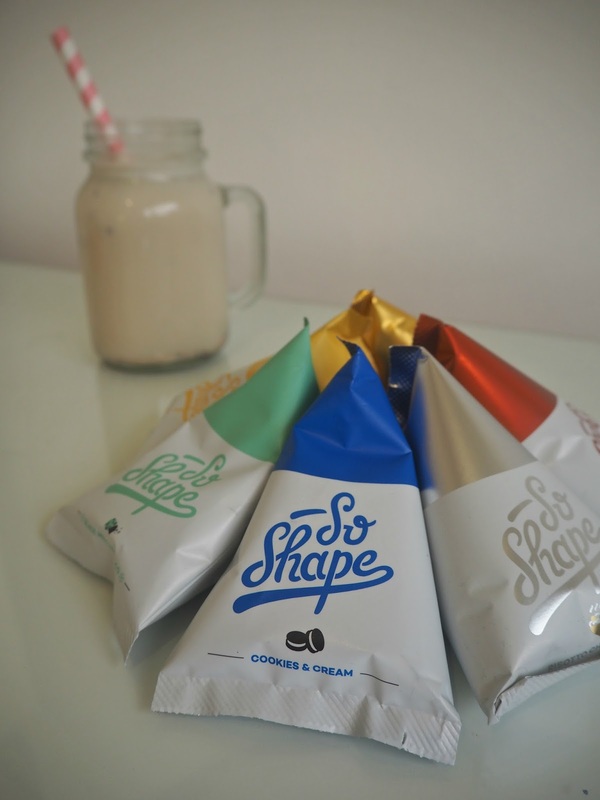 I have been so excited to write this post and tell you all about the So Shape 14 Day Challenge that I have recently tried and completed. 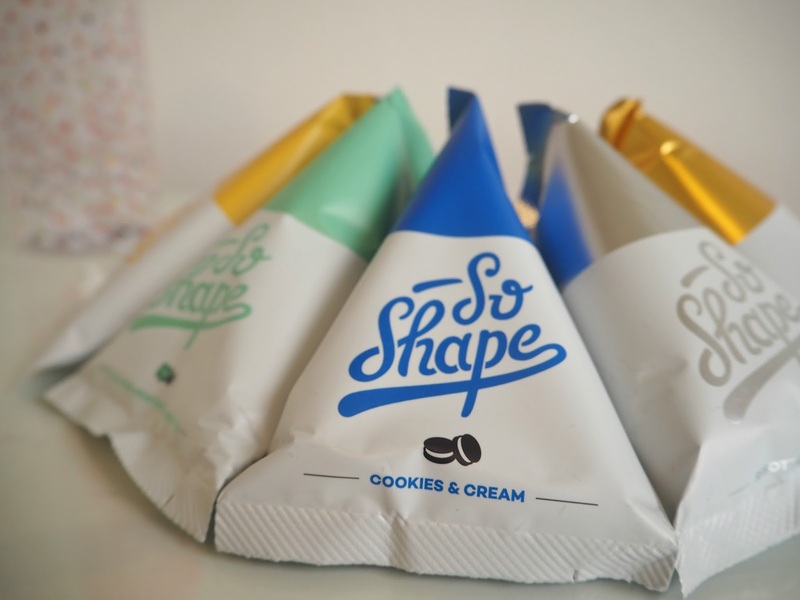 So Shape are a French brand, who create smart meals which make losing weight and still living a regular lifestyle work hand in hand... No dieting, no cutting out your favourite foods and no stress. After a Summer of enjoying lots of food and nights out, I knew this was something that I and my body would benefit from. So Shape have three programmes to choose from; 5 Days Reboot, 14 Days Remove and 28 Days Reborn, which you can choose from depending on how long you want to use the meals for and what kind of results you are hoping to achieve. I chose to take part in the 14 day programme, which helps you to lose fat and keep your muscles with a healthy diet that makes toning up and getting thinner much easier. This meant that I had to commit to two So Shape meals per day... Not much of a commitment if you ask me, I found it so easy to fit this into my routine and found myself substituting my breakfast and tea for a So Shape meal each day. I received 30 meals to use throughout the fortnight, in six different flavours of my own choosing from their vast range of 19 gourmet flavours. I opted for three savoury meals; Mushroom Risotto, Spicy Pasta Bolo and Cheese Pasta and three sweet meals; Cookies & Cream, Mint Choc Chip and Vanilla & White Chocolate. All of which are high in protein and fibre, gluten free and vegetarian. 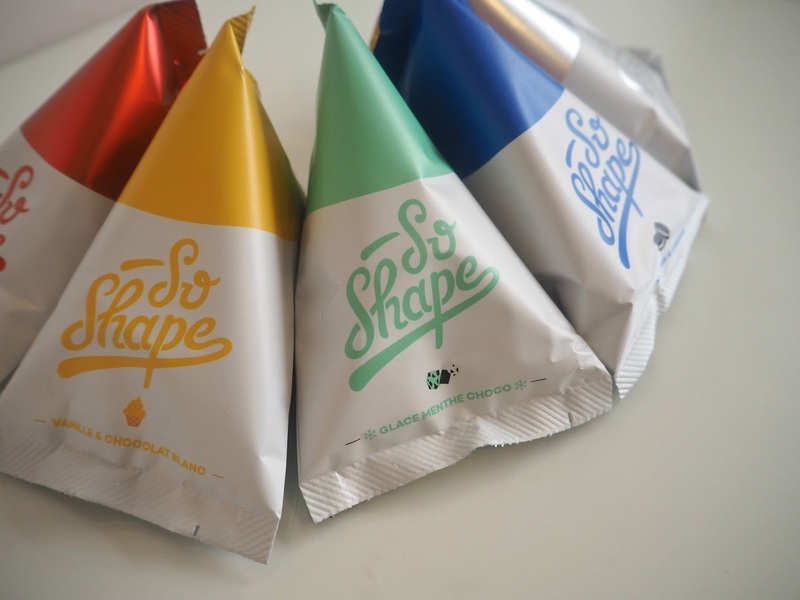 They come in really cute pyramid shaped packets and are accompanied by a shaker bottle to mix the meals in, which doubles up as a water infuser bottle too. 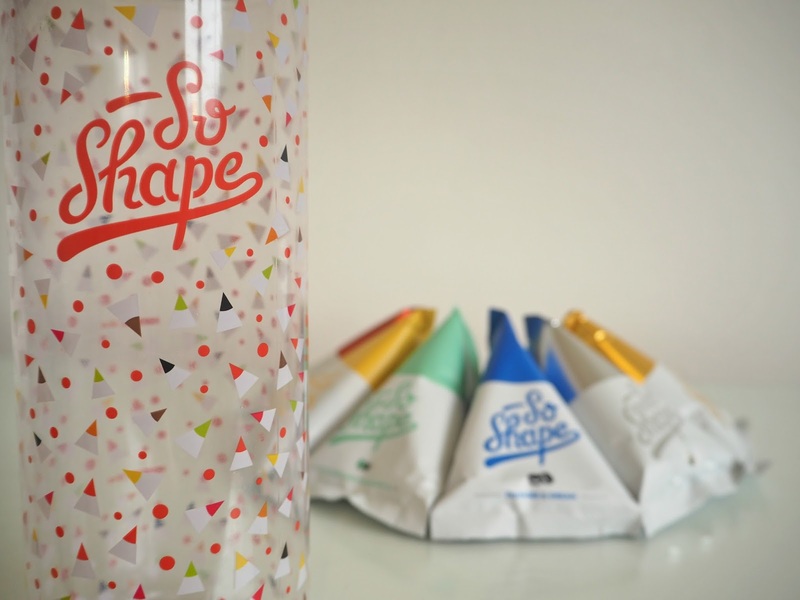 I love the extra attention to detail on the packaging, with motivational quotes and the So Shape social media channels are all packed full of inspiration, ideas and people to chat to about their journeys... It's a great way to socialise and learn more about fitness, health and ways to lose weight on the programme. I found the breakfast meal the easiest to stick to... I usually skip breakfast, or eat it late, so I chose to have a Cookies & Cream or Vanilla & White Chocolate milkshake most days, which I would sometimes have heated up. For the weekends or when I had more time, the Mint Choc Chip flavour makes an amazing frappe too... It tastes just like the ice cream! 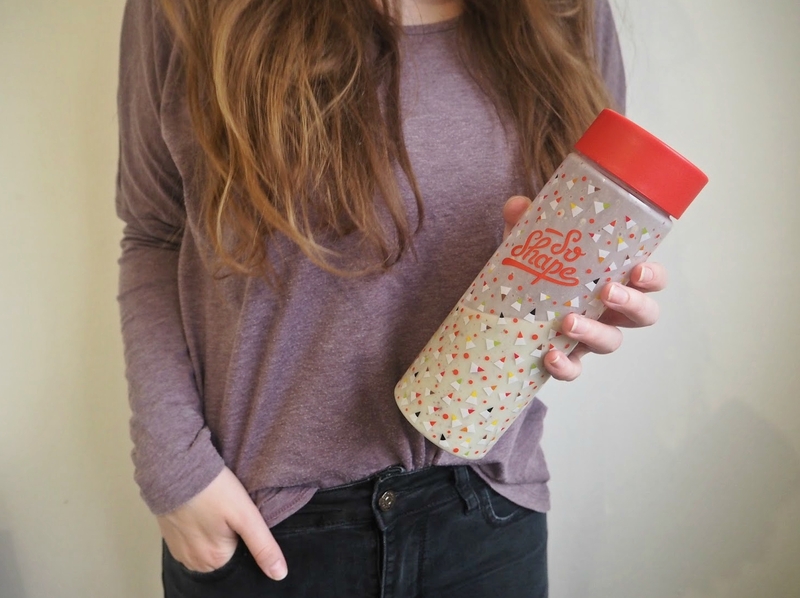 This was a really quick and convenient way for me to make sure I was having breakfast (you literally just add water to the powder and shake!) and it always kept me feeling full until dinner time, so there was never any desire to snack. I was really worried and a bit dubious about how the meals and shakes would taste... I've tried protein shakes before and have always found them a bit gritty and not overly tasty, however I have to say these have been the best I've tried so far. The powdery texture in the drinks is mostly disguised, as they have little pieces of cookie and chocolate in them and despite still having that 'protein flavour' to them slightly, the majority of the time, this is overpowered by the flavour of the drink and there is no awful aftertaste. For my evening meals, I loved all three flavours, but I think the cheese pasta was my favourite. It was really delicious with a little side salad or some crumbled pieces of grilled bacon on top. The mushroom risotto required no extras, I was quite happy eating this just as it came and the spicy pasta bolo was just the right amount of spice for me. I've really started to enjoy cooking over the past year or so, and it was great fun experimenting with the meals and ways to eat them. My favourite thing about these meals is that they left me feeling really filled up each day... I have a terrible habit of snaking on biscuits while I watch TV each evening, and although I did crave chocolate a lot (I'm slightly addicted, and sadly this is banned when on the challenge), I wasn't actually feeling hungry, so it was much easier to resist. I am so impressed that I actually lost weight while taking part in the challenge... I don't usually weigh myself, but for the purpose of this challenge I did, and I can report that I lost 3lb and around 4 inches from my waist in the fourteen days, which has resulted in me dropping a jeans size! If you would like to take on the 14 or 28 day challenge, you enter my code THATSPEACHY10 at the checkout to receive 10% off your first order of 14 or 28 day challenges.